The Lakes of Revine: Important Archaeological Site Among Gently Rolling Hills. 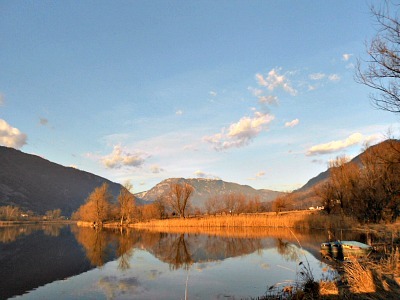 The Lakes of Revine ('Laghi di Revine'; see an image above) are located in the atmospheric setting of the Pre-Alps north of Treviso, bordering the Pre-Alps of Belluno. The area is also known as Vallata and it hosts the two peri-glacial lakes of Santa Maria and Lago, sole survivors of the passage of the ancient Piave ice sheet during the Quaternary glaciations. 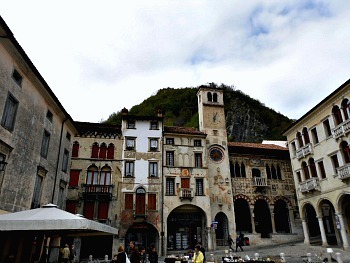 In the vicinity there are also other notable monuments, such as the Abbey at Follina (Abbazia di Follina) and the historical town centre of Vittorio Veneto (see image below); other villages and small hamlets are scattered around, and make this area particularly pleasant to visit, especially in spring and early autumn. Another location worth a visit, within a reasonable distance, is the Grotte del Caglieron – a set of natural and artificial caves situated in a small atmospheric canyon. 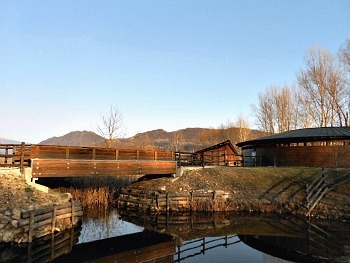 The archaeological finds in Colmaggiore di Tarzo and the will to enhance the context of the Revine lakes are at the basis of the Archaeological Park project called 'The Livelet'. 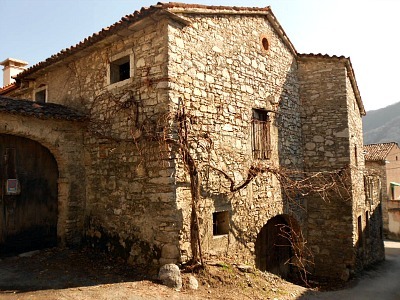 The area of Livelet is situated close to the artificial emissary called La Tajada ('The Cut') on the western bank of the Lago lake (one of the two Revine lakes), not distant from the historical village of Revine-Lago, where there are many examples of interesting vernacular architecture built in stone (see an image below). The area of the lakes in Revine is very interesting from a naturalistic point of view too; the flat terrain at the lakes' margins is characterized by a vegetation typical of wetlands, with an abundant presence of trees (mainly willow and alder), plants such as Phragmytes and thick bands of reeds (especially in the areas close to the actual banks). The realization of the Livelet Archaeological Park (see an image of the entrance area below) was preceded by an operation of partial drainage of the area and clearing of the shrubby invasive vegetation, which has seen the subsequent creation of small areas for cultivations, the planting of trees, new shrubs and other herbaceous species – all in keep with the autochthonous vegetation and the ecological needs of the local fauna, while respecting both the biotic and a-biotic components of the habitat. 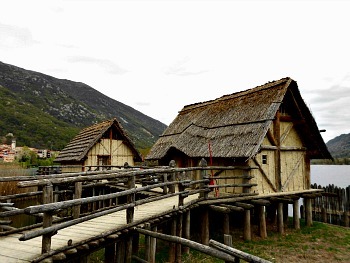 Given that certain archaeological data on the building methods and techniques used by the people living between the two lakes of Revine (Santa Maria and Lago) are not available as yet, the reconstruction of the pile-dwelling village (see image below) was based on the study of settlement typologies found in similar archaeological sites situated either in other lakeside or wetland locations as well as on the ethnographic study of populations that still live in similar environments. 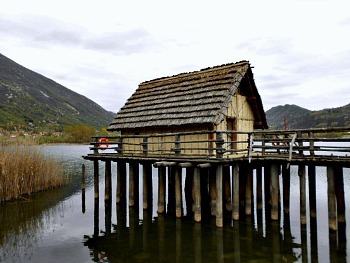 The pile-dwellings – created in real scale and situated in the proximity of the water – have been built in three different ways: one is on a wooden board sustained by vigorous wooden poles directly stuck in the water (first image below), another is on dry land (second image below) while a third is partly on land and partly on water (see image above). 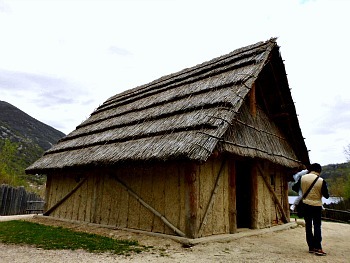 In the interior, the set-up reproduces a Neolithic, a Copper Age and a Bronze Age dwelling respectively. On indication of the local authorities that deal with archaeological sites, the village has been totally built in wood, so to guarantee a philologically exact reconstruction and also an environmentally sustainable solution, in line with the aims of the project. The choice of building material thus naturally fell on eco-compatibile timber that would adapt well to both the local geo-morphology and the archaeological evidence found in the area – that is: chestnut, spruce, oak and Cornelian cherry. The wooden parts meant to remain immersed in the water at all times have been crafted in larch wood – a type of timber which is particularly remarkable for its resistance to external agents, even though this species was not historically recorded in the area. The structural foundations of the pile-dwellings have been created with wooden poles, while the covers were crafted using cross sections of lakeside reeds, aptly anchored to the structural elements and then covered with a mixture of clay, straw and sand, held together with the help of quicklime. The roof cover – different for each typology of hut – was obtained with a traditional thatching technique that uses sections of reeds of about 30 cm of width. The Soligo valley was occupied 20,000 years ago (during the last Quaternary glaciations) by a branch of the Piave glacier, which formed a morenic apparatus in Gai (not far from here); the area freed itself from the ice sheet only after a few millennia, thanks to a gradual improvement of the climatic conditions. That is the time when the comeback of woodland and of the animals – and therefore of hunting – brought about the creation of the first human settlements in various locations, such as by several rock shelters (one called ‘Colon’ is between Segusino and Vas; some others are on the Col Visentin-Monte Faverghera mountain ridge and there is one also at San Giuseppe, near Corbanese). Finds and fossils coming from the archaeological digs – and as a result of other surface collections in the vicinity – have been taken to the Natural History and Archaeological Museum in Montebelluna (documenting Prehistoric, Proto-historic and Roman times in this territory), the Civic Museum in Crocetta del Montello (hosting the remains of a mammoth found in Bigolino) and the Museum of Man in Cansiglio (displaying material on Paleolithic and Mesolithic times) – as well as to the archaeological collections hosted at the Vittorio Veneto main museum. The archaeological finds and the structural remains found at Colmaggiore di Tarzo (mainly ceramic vases, lithic instruments and food remains) are all evidence of a settlement typical of a wetland area, extended on the thin strip of land that currently separates the two lakes of Santa Maria and Lago (technically speaking, it is a small isthmus). The small community hosted on this strip of land, which probably settled during the final phases of the Neolithic (4,500 years ago) and remained there up until the beginning of the Early Bronze Age (2,300 years ago), based their sustenance on agriculture, livestock farming and – in a lesser way – also on hunting, fishing and the gathering of products from the wild (they were still hunter-gatherers, after all, even though they were progressively moving towards agriculture after settling). From a technological point of view, these populations used instruments, tools and weapons crafted mainly in chipped flint or green stone (which were often obtained from quite some distance away, and then taken here), while for conserving, cooking and eating food they would make use of ceramic vases. Middle Palaeolithic and Mesolithic: From Neanderthal Man to Homo sapiens. Local references: the ‘Coolon shelter’ (‘Riparo Coolon’), Monte Faverghera and San Giuseppe ridge. The Pre-alps north of Treviso are the result of ancient phenomena of uplifting of the rocks, and of the erosion exercised by the glaciers of the Quaternary. Around 20,000 years ago, in fact, the Piave glacier occupied the Soligo valley, leaving a moraine apparatus at Gai and small branches in Tarzo and Nogarolo. The vegetation was sparse even on the better exposed slopes, and the snows were pretty much perennial. Some millennia after, a betterment of the climatic conditions favoured the withdrawal of the glaciers, the spread of larch in the Revine valley and the progressive expansion of conifer woodland at the highest altitudes, until the full affirmation of the montane beech woodland. In this territory, rich in game and flint to be chipped, the most ancient human settlements date back at least 40,000 years ago – the age of the Neanderthal Man. The human presence becomes more widespread at the end of the Superior Palaeolithic (12-9,500 BC), when the Italian Alps were populated by tribes that settled on elevated locations – as for instance at the Bus de la Lum or at Palughetto, on the Cansiglio plateau, in areas that were hugely exploited for hunting. This phenomenon lasted for a few millennia – at least until the end of the Mesolithic (5,500 BC), before the affirmation of agriculture. The Soligo valley and the ridges that overlook it were therefore areas of interest for the peoples of those times, who would hunt, fish, gather plants and mushrooms. Amongst the most important sites that we have to recall here are the ‘Coolon shelter’ (‘Riparo Coolon’), between Vas and Segusino; the settlements on the Monte Faverghera-Col Visentin ridge; those around Vittorio Veneto, and the site at San Giuseppe in Corbanese. From the ‘Coolon shelter’ (‘Riparo Coolon’) come remnants of deer, likely food remains and various artefacts in chipped flint. Scarce, instead, are the discoveries in high altitude, while the site at San Giuseppe can be considered the most important for the quantity of chipped flint, then transformed into tools and implements, as well as into arrow points. The Neolithic is documented here in its most recent aspects, datable especially between circa 4300 BC and 3400 BC. The archaeological data indicate the existence of human groups, who took with them cultural aspects connected with the last culture of the Square Vases (‘Cultura dei Vasi a Bocca Quadrata’) – so-called because of the typical mouth of the recipients – and the ‘Cultura della Lagozza’ which, at that time, extended its influence from Lombardy eastwards, to reach the eastern Veneto. The finds, widespread all over the territory, attest to the frequentation of this location on the part of communities dedicated to agriculture, livestock breeding and hunting – prevailing activities at the higher altitudes. Starting from the Ancient Neolithic onwards (3,800 - 3400 BC) are also steadily exploited the rich food resources offered by wetlands and lacustrine basins – as indicated precisely by the settlement on reclaimed land by the Laghi di Revine. During the Copper Age (between 3400 BC and 2300 BC) persists the frequentation of the areas already populated in the past, most likely with the same modalities of land use. The archaeological documentation is constituted, for the most part, of artefacts in flint, product of occasional finds. To be noticed are the regular excavation campaigns, carried out within the context of the settlement by the Laghi di Revine; to this, must also be added the recent investigations on Monte Doc, in the vicinity of Segusino, where a site for the extraction and the first manufacturing of flint was discovered, which was worked for the production of arrow points and larger dagger blades, characteristic for this period; in particular, it is to be stressed the importance of these latter elements, as they were symbols of the warrior, and therefore placed alongside him in the tomb, in the most prestigious funerary endowments. The Ancient Bronze Age (between approx. 2300 and 1650 BC) is witnessed by settlements located in the hills and foothill areas, especially in the proximity of wetlands and lakes (such as the Laghi di Revine) and of the numerous resurgent pools (‘risorgive’). The archaeological evidence presents substantial typological affinities with those of Northern Italy, where the culture of Polada (‘Cultura di Polada’) was widespread. During the Middle Bronze Age (1650-1300 BC) the communities present aspects typical of the culture of the ‘Terramare’ (‘Cultura delle Terramare’); the products of metallurgy bear witness to communities where a strong ideology of an heroic and warrior type is dominant. The evidence from the Recent Bronze Age (1300-1150 BC), instead, can be referred to the sub-Appenninic culture, which allows one to outline a minute occupation of the whole territory – excluding perhaps the gravelly high plains, not so adequate for an economy based mostly on agriculture and livestock breeding. This cultural and economic scenario will become more and more definite towards the Final Bronze Age (1150-950 BC), with the spread of the so-called ‘Cultura Protovillanoviana’. Important archaeological documentary evidence shows that the shores of the Laghi di Revine were already inhabited during the Neolithic, Copper and Bronze Age. In 1987, further excavations in the locality of Caomaggiore (Tarzo) allowed to individuate finds and structural remains which, during the course of successive campaigns (1989, 1992, 1997) were found to refer to a peri-lacustrine settlement (situated near the lake), typical of wetland areas – in this case extended over the isthmus that now separates the two basins. On the basis of the archaeological evidence that were found in this area (mainly ceramic vases, lithic instruments and food remains), we can establish with a certain degree of certainty that this settlement was started during the recent phase of the Neolithic (4500 BC), and that the human group who lived in the proximity of these lakes was distinguished by cultural aspects typical of the last phase of the culture of the Square Vases (‘Cultura dei Vasi a Bocca Quadrata’) and of the ‘Cultura della Lagozza’. It was a small community which based its subsistence on agriculture, livestock breeding and – to a lesser extent – hunting-gathering and fishing. Under the technological point of view, they used implements and tools in chipped flint and smoothed green stone, while in order to conserve, cook and consume food, they made use of ceramic vases. The frequentation of this site continued also in the subsequent Copper Age – probably thanks to the work of the same human group that had accepted aspects of the new ‘Cultura di Remedello’, which had started to spread after the second half of the 4th millennium BC in most of the Po valley. The peri-lacustrine settlement situated along the Laghi di Revine lasted until the beginning of the Ancient Bronze Age (2300 BC) when, despite noteworthy structural adjustments – constituted mainly of reclaimed soil, and with the assistence of ligneous and wall structures, due to the work of a human group belonging to the ‘Cultura di Polada’ – the area between the two basins was left for good. The archaeological importance of the Laghi di Revine is attested also by the finding of a bronze sword, which occurred during the first half of the 1900s, in the occasion of works for the excavation of a canal that linked the basin of Lago di Santa Maria to that of Lago. Subsequently were also discovered, by chance, two small daggers and a short sword – all weapons that can be dated to the Bronze Age. The contexts of provenance of these finds are not known (settlement, necropolis, votive deposit? ); nevertheless, they all document that the Soligo valley was frequented intensively also during the 2nd millennium BC. At the end of the Neolithic, during the Copper Age and a good deal of the Bronze Age, many human groups of the Alpine valleys and of the territories situated along the lakes erected their settlements on reclaimed land and over stilts – both along the banks of the lakes and on water. In order to talk about this subject, however, let us take a detour to the Valcamonica – an Alpine valley in eastern Lombardy. The Valcamonica hosts the biggest concentration of rock engravings in Europe (beyond 350,000), executed in a time lapse of more than 10,000 years. Amongst these engravings, one can recognise what – to this day – is to be considered the only representation of a stilt house to be known in the world: it is a drawing with a light graffiti (etching), no bigger than 14 X 9 metres, reproducing the structure of a house. In the drawing, one can easily recognise the marshy soil, expressed by means of a thick series of horizontal lines; the posts that sustain the aerial frame, which in turn supports the construction, covered with a roof with two jutting eaves; the same frame seems to be surrounded by a ‘safety railing’, so to speak; it is also evident the reclaiming work that has been carried out under the building, which is raised above ground. These houses – raised on stilts and supported by posts anchored to the marshy soil, or at the bottom of the lakes – were made, in some cases, of trunks, but more frequently of load-bearing wooden structures that supported the weight of the roofs, and of cladding made of tree branches, straw or reed, covered in clay. The roofs were generally in cereals’ straw, herbs and/or reeds. The structures were quite solid, and often protected by high fences.